It’s a scary truth that the biggest corporation developing genetically modified food crops share their highest ranking staff with the US Government, and vice versa. This is nothing new, with the roots of genetically modified food reaching back into US politics for over twenty years. 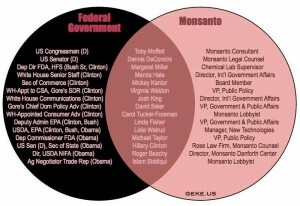 This image shows the connections between Monsanto and the US Government, with people employed by both listed and named. This beautiful lady’s youthful health is attributed to her mostly raw vegan diet, but also, I bet her beautiful loving outlook on life is a major part of her health success! Click the link to watch the video of this extraordinary 71 year old lady.